Another very successful Australia Day breakfast! 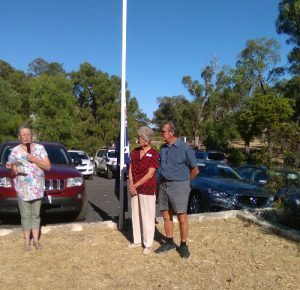 Pat and Peter Brown raised the flag and Jenny Rose told us a bit about them. “Pat and Peter are among the very early residents of Armstrong Hills, having moved into their home in 1989. There were four other homes either occupied or being constructed in the subdivision and there were no telephones. Even if they had invested in what were then very expensive (and clumsy) semi mobile phones, they would have been useless because there was no signal. Pat and Peter’s block was impacted by the fire in January 2011. Very fortunately, their house was not burnt but they lost their fences and much of their garden. Even that traumatic experience could not dampen their enthusiasm for living in this beautiful locality. They have been on the committee of the Association since about 2005 and most importantly have always been here to lend a hand. Whether it is cooking sausages, hanging pictures, working in the kitchen, delivering newsletters or whatever else has needed doing, they have always been first to offer help and have never complained or sought recognition. 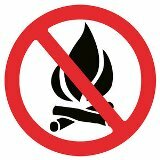 Total fire bans have been declared for Australia Day, 26th January 2107, in the shires of Armadale. Boyup Brook, Bridgetown-Greenbushes, Chittering, Collie, Dardanup, Donnybrook-Balingup, Gingin, Gosnells. Harvey, Kalamunda, Mundaring, Murray, Serpentine-Jarrahdale, Swan, Toodyay and Waroona. 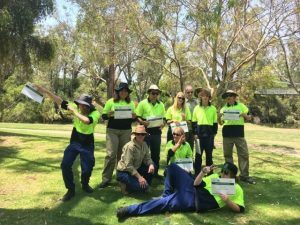 The Peel-Harvey Catchment Council (PHCC) Green Army team graduation, on the 30th November 2016, was held at Cantwell Park Pinjarra. This Green Army team was “donated” by the PHCC to help with the Lake Clifton-Herron Landcare Group’s re-vegetation work around Lake Clifton. Without this help the 2016 work would not have been achieved. The Landcare Group’s project —3R’s for Lake Clifton – Restore, Re-habilitate, Re-Vegetate— funded by the State National Resource Management programme, is ongoing and continues the work done over the past 5 years. 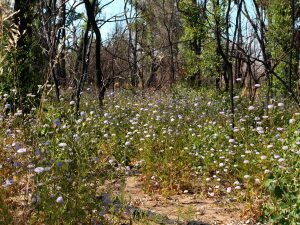 Some of the bush areas burnt last January are awash with blue – Rottnest Island Daisies. A sight to see. A good vantage point is along Coronation Road. Turn left at the end of the quarry about 3-4km south of Lake Clifton Road and go along for about a km. 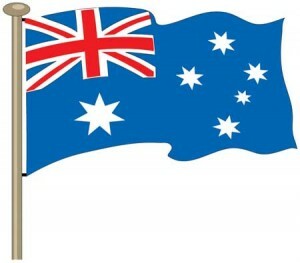 Following the great success of the breakfast in 2016, there will be NO CHARGE for breakfast on Australia Day in 2017.Everybody is welcome – you do not need to be a member of the association BUT the association cannot afford to continue providing this free indefinitely unless we have a lot more members. The Shire of Waroona will not fund us as they want us all to go to Waroona and the City of Mandurah will not fund us because the hall is not in their shire. So like most things in our area, we have to do it ourselves. PLEASE consider paying the modest $27.50 per family to support this and the other services we provide. A membership application is available here. We don’t want anyone to miss out on food so PLEASE RSVP via a Facebook comment or our web site or contact Jenny on 0428343028 or email before Monday 23rd. The flag will be raised at 8:00 am followed by breakfast from 8:15 to 9:15. 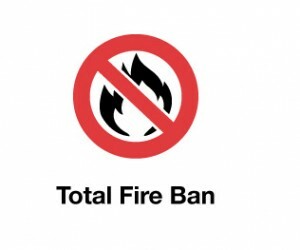 A total fire ban has been declared for Tuesday 4 January 2017 in the Shire of Waroona. Bans for other shires have not yet been declared – this post will be updated if other shires are affected.